Celliola, a group created by Cynthia Fogg and Tom Flaherty, debuted several new songs, each with a diverse array of styles and meaning, at their annual fall concert on Sunday at Pomona College. About 120 people arrived at the Bridges Hall of Music to listen to the duo’s new music. 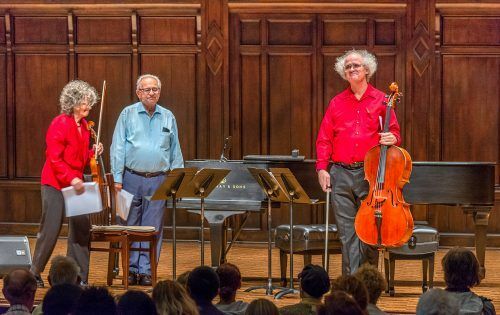 To help perform the music, Fogg and Flaherty were accompanied by Pomona College faculty Karl Kohn, Genevieve Lee, William Peterson, Gwendolyn Lytle, Scott Lehmkuhl, and Joti Rockwell. The duo performed music written by Caroline Shaw, Karl Kohn, William Appleton, Eric Moe, Jack Van Zandt, and Flaherty himself. Celliola was accompanied by Lytle, Lehmkuhl, Rockwell, and Lee for the world premiere of “A Lamp Unto Thy Tweet,” a political commentary piece about Donald Trump’s presidency. The song featured the voices of Gwendolyn Lytle, soprano, and Scott Lehmkuhl, bass, with one dressed as the Statue of Liberty and the other, Trump. The lyrics of the piece were taken from Trump’s words and “The New Colossus,” a poem written by Emma Lazarus in 1902. “A Lamp Unto Thy Tweet” was the center piece of program, despite it being the finale. The focus of this piece wasn’t the instrumental aspects, but the message of the lyrics. The instrumental parts of this song were in the background, overshadowed by the singers. The audience loved the piece, giving the performers a standing ovation lasting three minutes. The program began with Fogg, viola, and Flaherty, cello, performing “Limestone and Felt,” a piece composed by Caroline Shaw. “Limestone and Felt” featured both the viola and cello being bowed and plucked. Flaherty and Fogg plucked their instruments to create short, whimsical notes that echoed across the theater. These whimsical notes were juxtaposed by delicate, longer notes created by bowing their instrument. This song contrasted two different styles of playing the viola and cello as if they were actual limestone and felt, both being hard and soft materials respectively. The first part of this piece was serene, which was then followed by a ballad signifying loss. The song ended with an upbeat ensemble that sounded like a celebration. The audience reacted with a vigorous, roaring applause and standing ovation after every song performed.